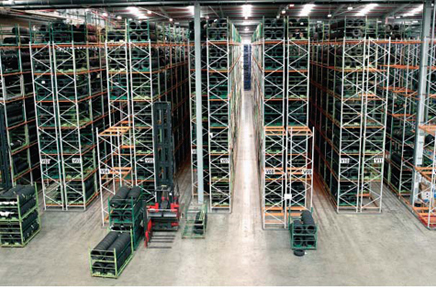 Cubic and floor space are utilised to the ultimate capacity with a Very Narrow Aisle racking system! Space Utilisation – Aisle widths are reduced by up to 50% in comparison to a counter balance truck. If that isn’t enough, stacking heights can also be doubled, increasing pallet capacity further. Increased security – Due to the need for specialist equipment to access stock, security of pallets is increased considerably. Health & Safety – The nature of the very narrow truck makes for improved safety and greater control of load handling within the system. 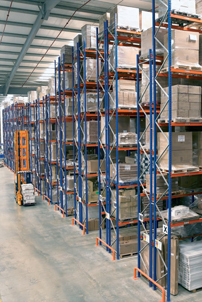 Whilst keeping rack damage to a minimum, health and safety within the warehouse is increased with Apex Very Narrow pallet racking. Maintenance – Either wire guided or rail guided trucks mean that the risk of damage to your storage system is kept to a minimum. This reduces maintenance costs in the long run whilst maintaining maximum efficiency through reduced downtime.